Modern Kenya music has been heavily influenced by foreign sources: Congolese music, American hip hop, Jamaica’s Bob Marley. Kenya also has its own traditional music styles, although lately these have also been influenced by the above-mentioned sources. The live scene is mostly limited to Nairobi and the cities and villages along the coast. But the matatus (public minibuses) make sure very loud music is heard everywhere in Kenya, and cheap CDs and cassette tapes can be bought in many shops and road stalls. The Daily Nation newspaper publishes weekly Top 10 charts as well as country-wide gig listings. Lingala is the Kenyan version of the soukous and rumba styles that were developed in Congo (DRC) in the 1930s and 1940s and which spread, via Tanzania, to Kenya in the 1970s. One reason was the deteriorating political situation in Congo, which made many Congolese flee to East Africa. Lingala is upbeat party music characterized by clean guitar licks and a driving drum rhythm. A well-known lingala group from Kenya is the Gold Sounds Band, led by Twahir Mohamed. The name lingala refers to the language of the region where it originated. Kwassa kwassa is a fast-paced form of lingala. Another popular form is called ndombolo, a fast, hip-swinging, booty-shaking dance. Critics allege it is obscene and have tried to get it banned in several African countries, including Kenya. It has only led to it enjoying even greater popularity. Benga is truly Kenya music. Benga is high-energy dance music with funky guitar riffs and a pulsating beat. Guitar, bass guitar and percussion are the main instruments. Benga originated between the 1940s and 1960s when Luo musicians started playing traditional music in a modern electric band setting. 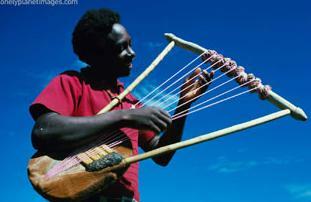 The eight-string lyre played by the Luo, called nyatiti, was replaced by the electric bass guitar. Contemporary Kikuyu music often borrows from Benga. Shirati Jazz, formed in 1967, is seen as the first major Benga band. Other major artists and groups are D.O. Misiani, Victoria Jazz, Queen Jane, and the Migori Super Stars. Many of them have made the pop charts in East Africa many times. Sigana is a traditional performance art which contains elements of all the major African traditional cultural forms: storytelling, song, music, dance, rituals etc. So music is only one element. Active participation is a key feature of sigana. The line between performers and audience is less clear than in many other art forms. You won’t see performances often along the tourist trails, but the Mzizi Arts Centre in Nairobi (Moi Avenue) organizes monthly Sigana performances. American-style rap and hip hop also spread to Kenya in the 1990s. Pictures of 50 Cent and Snoop Dogg can be seen everywhere in major cities and their music blasts out of the matatus (overcrowded public minibuses). Major Kenyan acts are Necessary Noize, Kalamashaka, Poxi Presha and Hardstone. Although their sound is very similar to American rap groups, their lyrics are definitely Kenyan. Taarab is a beautiful mixture of African, Arabic and Indian music styles. It is played most in the Islamic Swahili coastal region, originally at weddings. Instruments used are drums, tambourines, accordions and a lute called the udi. Electric guitars, fiddles and especially synthesizers are modern additions. Major Taarab artists are Miraj Juma, Zuhura Swaleh and Malika. If you subscribe to my ezine "Letters from Nairobi" below, you'll receive access to the Subscribers Area where you download original Masai, Kikuyu and other Kenyan music in MP3 format. You can also download special reports and photo collections there. You'll also receive my e-zine with the best travel tips, new discoveries of hidden gems, special offers, etc. You can easily unsubscribe at any time through a link in each newsletter. Yes, Send Me My Password!